Do emotional empaths get more sensitive as they age? Yes, empaths get more sensitive as they age if they are on a path to develop their spirituality and intuition. As your heart opens, the more sensitive you become. However, you must learn skills to center your energy in general and with your soul mate. You must discuss the situation with your partner and the two of you can work together to find a happy medium. As an empath, you may need some more alone time to meditate and refuel. I often advise my patients to close their eyes. Focus on their breath. Then gently extend their awareness downward to strata, bedrock, minerals, and soil. From the base of their spine begin to feel a continuity with the earth’s core. Picture having a long tail that roots in that center. Allow the earth’s energy to infuse their body and stabilize them. If you meditate for five minutes or an hour this is sacred time. 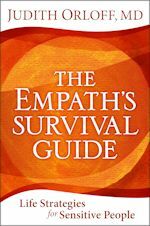 I recommend that you read my book, The Empath’s Survival Guide for relationship tips and more strategies on staying centered and grounded.